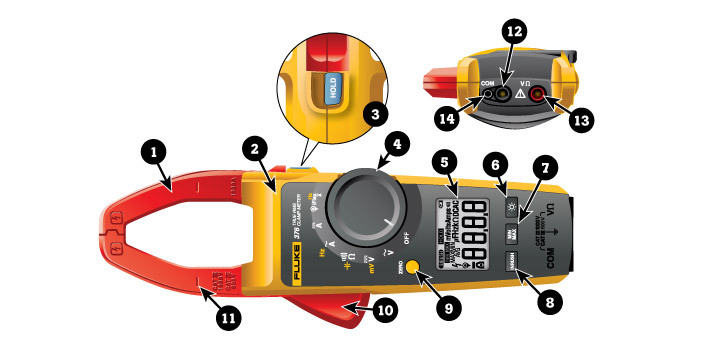 Basic features of a clamp meter (Fluke 376 shown here). A clamp meter is an electrical test tool that combines a basic digital multimeter with a current sensor. Clamps measure current. Probes measure voltage. Having a hinged jaw integrated into an electrical meter allows technicians to clamp the jaws around a wire, cable or other conductor at any point in an electrical system, then measure current in that circuit without disconnecting/deenergizing it. Beneath their plastic moldings, hard jaws consist of ferrite iron and are engineered to detect, concentrate and measure the magnetic field being generated by current as it flows through a conductor. Tactile barrier (to protect fingers from shocks). Hold button: Freezes the display reading. Reading is released when button is pushed a second time. Min Max button: On first push, display shows maximum input. On subsequent pushes, minimum and average inputs are shown. Works in current, voltage and frequency modes. Zero button (yellow): Removes dc offset from dc current measurements. Also serves as dial’s shift button to select yellow functions scattered around the dial. Alignment marks: To meet accuracy specifications, a conductor must be aligned with these marks. Input for flexible current probe. Originally created as a single-purpose test tool, modern clamp meters offer more measurement functions, greater accuracy and in some cases specialized measurement features. Today’s clamp meters include most of the basic functions of a digital multimeter (DMM), such as the ability to measure voltage, continuity and resistance. Safety. Clamp meters allow electricians to bypass the old-school method of cutting into a wire and inserting a meter’s test leads into the circuit to take an in-line current measurement. The jaws of a clamp meter do not need to touch a conductor during a measurement. Convenience. During a measurement, it is not necessary to shut off the circuit carrying current—a big boost in efficiency. Clamp meters are preferred for measuring high levels of current. DMMs cannot measure 10 A of current for more than 30 seconds without risking damage to the meter. Clamp meters offer a minimum current range of 0 A to 100 A. Many models have a range up to 600 A. Others go up to 999 A or 1400 A, and some plug-in clamp accessories such as the iFlex® can measure as high as 2500 A. Service: To repair existing systems on an as-needed basis. Installation: To troubleshoot installation problems, perform final circuit tests, and supervise apprentice electricians while installing electrical equipment. Maintenance: To perform scheduled and preventative maintenance as well as system troubleshooting. Current transformer clamp meters: measure only alternating current (ac). 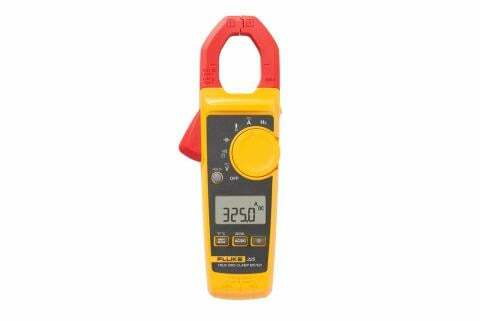 Hall Effect clamp meters: measure both alternating current and direct current (ac and dc). 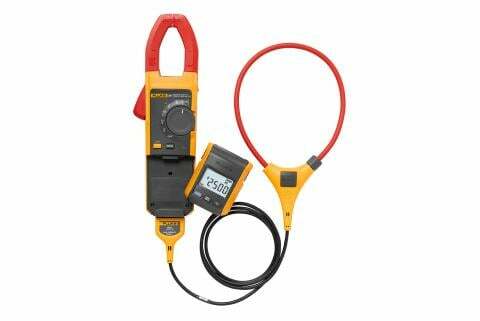 Flexible clamp meters: employ a Rogowski coil; measure ac only; good for measuring in tight spaces.